This chapter describes how to create a Caché wrapper class for an ActiveX component and how to use this wrapper class within an application. 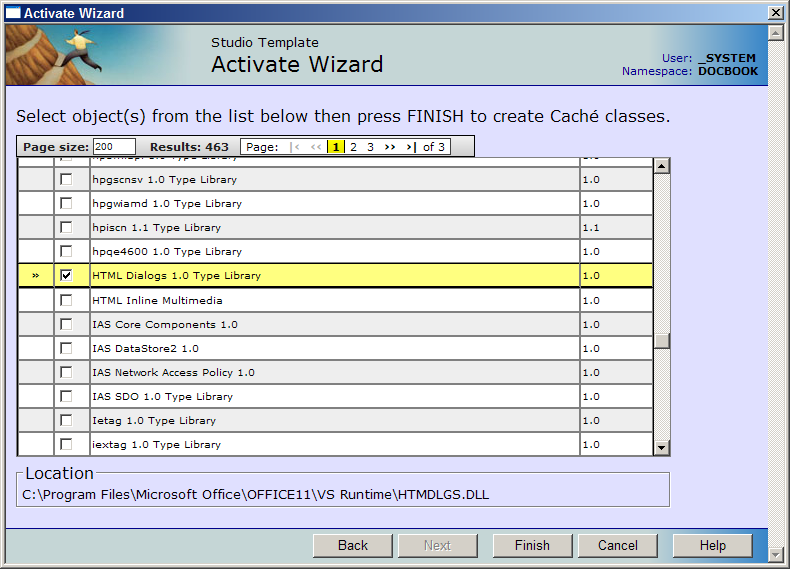 The Caché Activate Wizard automatically creates one or more Caché wrapper classes for a given set of ActiveX interfaces. Select a project for your application. Select Tools > Add-Ins... from the main menu and press the Next button. Expand the item Standard Add-Ins and select Activate Wizard. Enter the package name you wish to use for the generated classes, and press the Next button. Choose one or more interfaces and press the Next button. On a 64-bit version of Windows with a 64-bit cache, you can call 64-bit ActiveX controls. This will not enable a 64-bit cache to use 32-bit ActiveX controls (which is impossible due to operating system constraints). However, some companies are now releasing 64-bit versions of their existing 32-bit controls, allowing customers to migrate to 64-bit systems. The classes that are generated in Caché are proxy classes for the COM objects. Once the classes have been generated and compiled, you can then use them in Caché applications. 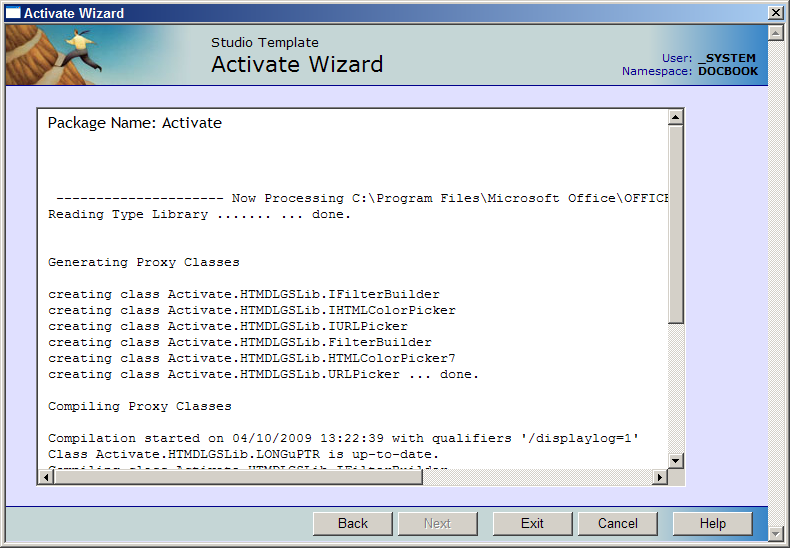 For example, using the Activate Wizard, you can generate wrapper classes for the Microsoft SysInfo Control, which provides some information regarding system resources. Activate.SysInfoLib.ISysInfo  An abstract interface class that defines the methods and properties which the ISysInfo interface provides. It cannot be instantiated. Among others it has a calculated property called BatteryLifePercent along with corresponding get and set methods for that property. Activate.SysInfoLib.SysInfo  This is a concrete class that inherits from the ISysInfo class. It contains the code that finds and instantiates the external COM object and maintains a connection to that object. You use this concrete class to manipulate the external object. When the object is closed, the external COM object is closed (released) also. The object is created in the same manner as any other within Caché. The BatteryLifePercent property is written out and finally the object is closed. The Caché Activate Wizard enumerates the type libraries on a Caché Server by using a COM object called TL.dll (or TL64.dll on 64-bit systems. The file is placed in the <CacheRoot>\Bin directory and automatically registered during Caché installation). The Caché classes that are generated from this object are preloaded into the %Activate.TLLib package. %Activate.TLLib.IUtils  an abstract interface class that has a single property, libraries of type ILibraries. Use this property to retrieve the ILibraries interface for enumerating the type libraries on the system. %Activate.TLLib.ILibraries  an abstract interface class that exposes the Count and Item properties. Use these properties to enumerate the type libraries on the system. Write !, $Piece(tld,"|"), !, $Piece(tld,"|",2), !, $Piece(tld,"|",3), !! If objLibs'="" Set objLibs = ""
If objUtils'="" Set objUtils = ""
As shown in the previous example, in COM, some properties have parameters. Furthermore, some objects have what is known as a default property, which means you can reference that property without specifying its name explicitly. Workbooks.Item("Sheet1") ' Item is a property! This works because ItemGet is the method that retrieves the Item property. Any COM object may raise an exception as the result of some operation, be it a method call or a property set/get. When an exception is raised, the exception is propagated into Caché via the ZTrap mechanism. The calling code will receive an error with the error code <ZACTX> and the local variable %objlasterror will contain a complete textual description of the error. Programmers should plan for this error and take action accordingly. Some COM objects do not come with a type library or you may find that the return type of a method or a property type of a COM object is just an IDispatch interface. How do you call methods and access properties for such objects? 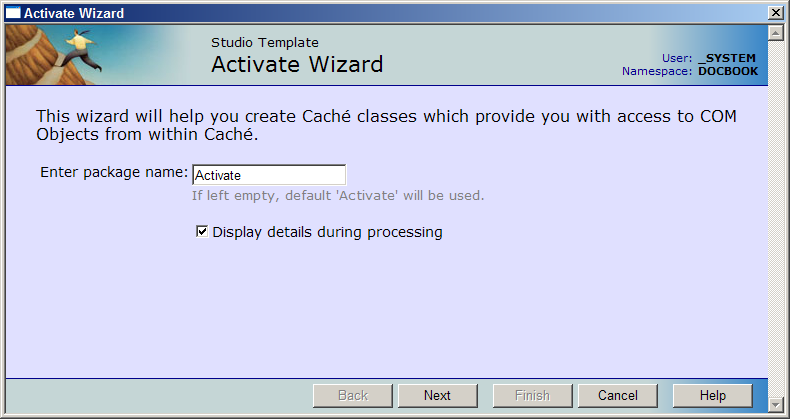 Caché Activate provides two classes which assist with this problem, %Activate.IDispatch and %Activate.GenericObject. Sometimes a type library specifies a method or a property which has a return type of the generic IDispatch interface. This can be very inconvenient because what you get is, in effect, an instance of %Activate.IDispatch on which you are forced to use generic methods (such as GetProperty) in order to get and set properties and invoke methods. If you know the interface that it really should be (from documentation or otherwise), then you can call the Become method on an instance of %Activate.IDispatch object and retrieve the new (now typed) interface. The Become method takes the name of a class as its argument. Effectively, %Activate.IDispatch becomes an instance of the class name you pass to the method. Become will throw an exception if the object you call does not support the new typed interface. Some COM components have the ability to fire events during the processing of a method. The events are grouped into an event or source interface given a name. For example, given a COM object called MyClass, the interface may be called MyClassEvents or in the case of a COM object created with Visual Basic __MyClass. Caché Activate provides for the event handling via two classes: %Activate.RegisterEvents and %Activate.HandleEvents. If a COM object generates events, the generated Caché class will inherit from the %Activate.RegisterEvents interface class. This adds two methods %RegisterHandler and %UnRegisterHandler. In addition to the regular COM object proxy class, another class is generated which represents the Event interface. This will inherit from %Activate.HandleEvents and implements the %Advise and %UnAdvise methods as well methods to handle specific events as defined by the event interface. An example may make things clearer. Suppose we have a hypothetical COM object which does an FTP transfer. As well as implementing methods such as Connect, Close, and Download, the object implements an Event interface which expresses a single method, BytesTransferred. Following a successful connection and initiation of a download, the FTP object will fire the BytesTransferred Event after each 1 kilobyte of data that it has downloaded. The Event will be represented by a BytesTransferred method which has two parameters, an integer, Bytes and a boolean, Cancel which is passed by reference. When the Event fires, the BytesTransferred method will be called passing the current value of the arguments, Bytes and Cancel. These values are then available for processing. Typically the Bytes argument will be displayed via the user interface. Because the Cancel argument has been passed by reference, its value may be set and returned to the COM object which fired the event. In this instance setting Cancel to True (-1 for COM) will indicate to the COM object that the current operation should be interrupted and the call to Download should return immediately. If the download completes normally, the call to Download will return control to the caller and no more events will be fired. In Caché, the FTP COM object would be represented by a generated class such as Activate.SomeLibrary.FTP and the event interface by the class Activate.SomeLibrary.FTPEvents. It is up the developer to actually implement the BytesTransferred method by editing the Activate.SomeLibrary.FTPEvents class directly or preferably by subclassing the class and providing the implementation in the subclass.